More than 22,000 fans walked through the gate at the ample Kegums circuit for the Grand Prix of Latvia today and saw Rockstar Energy Suzuki World MX1's Clement Desalle grab his eighth podium finish with third overall across the dark and rough terrain east of the capital city of Riga. Desalle's team-mate Kevin Strijbos was seventh at the fifth edition of the event and the second race in a three-week back-to-back spell that will also see the Belgian team heading further east to Finland in the next few days. Kegums - slated to host the 2014 Motocross of Nations in 14 months' time - blended hard-pack and small, lethal bumps with soft, sandy sections and a fast layout. The course was heavy on the motorcycles and the resilience of the Grand Prix stars while warm conditions also increased the physical difficulty. After qualifying in fifth and sixth positions with their factory RM-Z450s, Desalle and Strijbos lined-up for the first of two 35 minute and two-lap motos; the former, searching for better form and a higher level of performance after a tricky run on Saturday, was immediately into third place behind Antonio Cairoli. The Belgian was stuck in a void of being unable to reach the reigning World Champion but carrying enough speed to safely keep ahead of Jeremy Van Horebeek. Desalle drew closer to the Sicilian at one stage but the intervention of some backmarkers re-established the gap. The 24 year old ran a similar race later in the afternoon. This time it was Ken De Dycker who was distant ahead and the Suzuki man also had to deal with the attentions of Tommy Searle until the Brit stalled his bike in a turn. Two third positions put Desalle back on the podium and meant that he has only missed the top-three once in the last seven meetings. His Latvian efforts represented a gain of six points on Gautier Paulin in the MX1 standings and the margin to second spot now rests at just 18. Cairoli is 82 points adrift at the top. Strijbos enjoyed better starts but lamented a lack of attacking verve in the formative stages of the motos that would have taken him with Desalle and into podium contention. Shades of arm-pump blunted any aggression at spells during the first moto as he rode to sixth place; and although he improved for the second dash, he could not relegate Searle in the closing moments of the Grand Prix to earn the same ranking, eventually finishing seventh. The Belgian veteran is fifth in the 2013 MX1 standings and 79 points behind De Dycker. Hyvinkaa will see the FIM Motocross World Championship roll into town for the first time this century next weekend. "Yesterday I really did not have a good feeling on the track so we made some different settings on the bike and it was much better in the first moto. It was a positive step and also good that I stayed on two wheels because Saturday was a different story! I focussed hard on my riding today and could finish third. The two guys in front were a little bit faster. My start was better in the second moto and I pushed to get into third but Tony and Ken had a little gap and it was difficult to come back. I saw my speed was good and I was aware that a few guys were catching me in the last 10 minutes but I stayed concentrating on the lines and keeping consistent. Finishing third on the podium is pretty good but I'm still a bit disappointed that it cannot be better and I am not winning at the moment." "In one way today was good. The first and the second motos were actually the same and the starts were OK...but I was losing too much time in the beginnings of both. I feel like the results could be better. I was fourth at the beginning of the first moto and then Van Horebeek passed me. I made some mistakes and got some arm-pump. I had a few hard laps but then started to pick it up again. Sixth was OK, considering. I ran a bit wide out of the first corner in the next moto and then struggled to get that fast pace going in the first few laps. I was then by myself and it was pretty boring! I was running the same lap-times and couldn't catch anyone. It was like I was just waiting for the race to finish! I tried to close to Searle in the last two laps but made mistakes and it wasn't possible. My riding and cornering was better than the first moto but the biggest problem is the first 10 minutes. Next week will be a sand track I guess, and I'm good in that." MX1 Moto1: 1. Ken de Dycker (BEL, KTM), 39:15.569; 2. Antonio Cairoli (ITA, KTM), +0:07.750; 3. Clement Desalle (BEL, Rockstar Energy Suzuki World MX1), +0:12.832; 4. Jeremy van Horebeek (BEL, Kawasaki), +0:25.821; 5. Gautier Paulin (FRA, Kawasaki), +0:32.184; 6. Kevin Strijbos (BEL, Rockstar Energy Suzuki World MX1), +0:34.058; 7. Tommy Searle (GBR, Kawasaki), +0:34.392; 8. Evgeny Bobryshev (RUS, Honda), +0:42.651; 9. Maximilian Nagl (GER, Honda), +0:48.658; 10. Davide Guarneri (ITA, KTM), +0:57.589. MX1 Moto2: 1. Antonio Cairoli (ITA, KTM), 39:33.938; 2. Ken de Dycker (BEL, KTM), +0:05.408; 3. 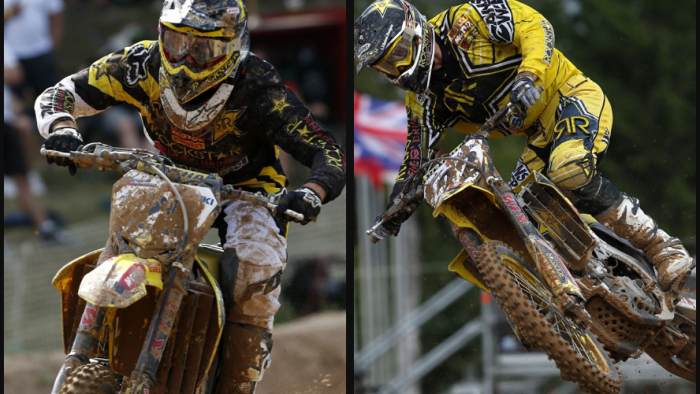 Clement Desalle (BEL, Rockstar Energy Suzuki World MX1), +0:09.753; 4. Gautier Paulin (FRA, Kawasaki), +0:12.063; 5. Jeremy van Horebeek (BEL, Kawasaki), +0:14.796; 6. Tommy Searle (GBR, Kawasaki), +0:24.159; 7. Kevin Strijbos (BEL, Rockstar Energy Suzuki World MX1), +0:28.675; 8. Rui Goncalves (POR, KTM), +0:49.576; 9. Joel Roelants (BEL, Yamaha), +0:57.013; 10. Matiss Karro (LAT, KTM), +1:13.104. MX1 Overall result: 1. Antonio Cairoli (ITA, KTM), 47 points; 2. Ken de Dycker (BEL, KTM), 47 p.; 3. Clement Desalle (BEL, Rockstar Energy Suzuki World MX1), 40 p.; 4. Gautier Paulin (FRA, Kawasaki), 34 p.; 5. Jeremy van Horebeek (BEL, Kawasaki), 34 p.; 6. Tommy Searle (GBR, Kawasaki), 29 p.; 7. Kevin Strijbos (BEL, Rockstar Energy Suzuki World MX1), 29 p.; 8. Rui Goncalves (POR, KTM), 23 p.; 9. Maximilian Nagl (GER, Honda), 19 p.; 10. Joel Roelants (BEL, Yamaha), 18 p.
MX1 World Championship Standings (after 11 of 17 rounds): 1. Antonio Cairoli (ITA, KTM), 514 points; 2. Gautier Paulin (FRA, Kawasaki), 432 p.; 3. Clement Desalle (BEL, Rockstar Energy Suzuki World MX1), 414 p.; 4. Ken de Dycker (BEL, KTM), 406 p.; 5. Kevin Strijbos (BEL, Rockstar Energy Suzuki World MX1), 327 p.; 6. Tommy Searle (GBR, Kawasaki), 318 p.; 7. Maximilian Nagl (GER, Honda), 272 p.; 8. Jeremy van Horebeek (BEL, Kawasaki), 271 p.; 9. Rui Goncalves (POR, KTM), 203 p.; 10. Davide Guarneri (ITA, KTM), 186 p.